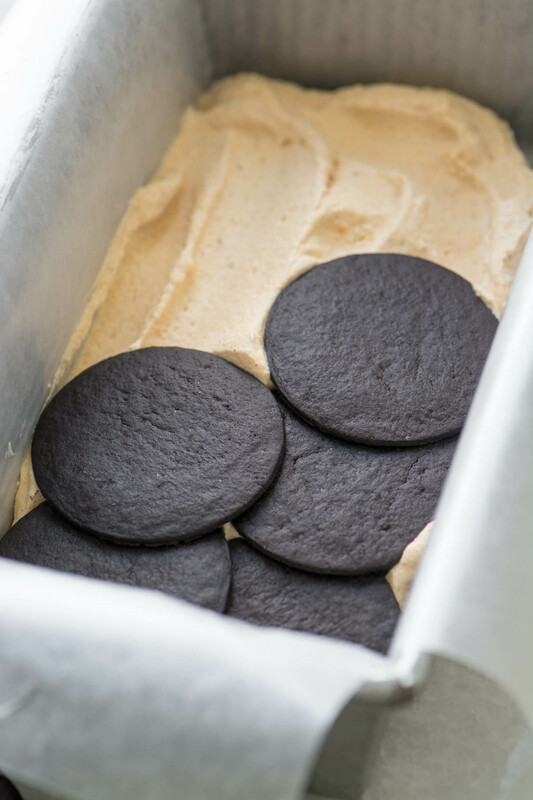 You know the drill I’m sure…after this Pumpkin Spice Ice Box Cake sets up in the fridge for a few hours the creamy filling penetrates the crisp chocolate wafers and creates the most intensely luxurious mouthfeel ever. Part cake, part mousse, it slices like butter to show off layers of inky chocolate and fluffy pumpkin spice. Yum doesn’t begin to describe it. 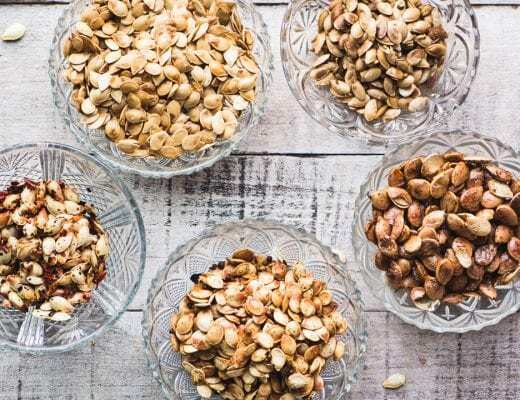 Why should we relegate one of the best ideas in the dessert world to the warmer months? 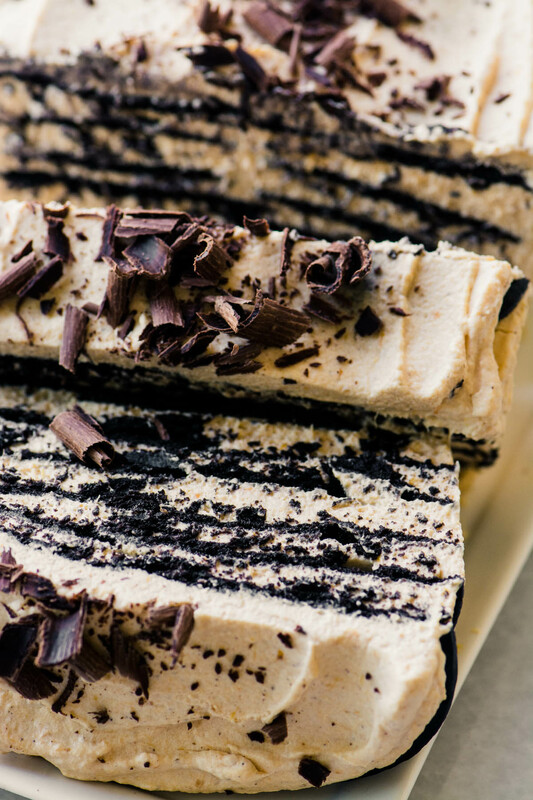 Ice box cakes should be a year round pleasure, and I’m seeing to that with today’s fall inspired recipe. Instead of plain whipped cream I’ve folded in pumpkin puree and a sprinkling of spices like ginger, cinnamon, nutmeg, and allspice. Honestly the filling could be a dessert in itself, just dollop it into pretty glasses and top with some crushed gingersnaps. This pumpkin ice box cake is a nice dessert for those times when you want to get everything set ahead of time. It can be made the day before and stored in the fridge overnight. 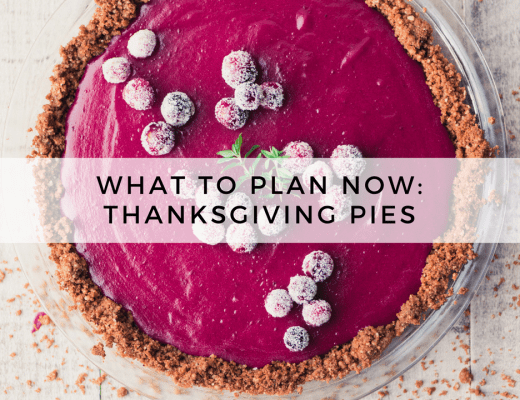 And during the holidays it can be a lifesaver, it will wait patiently in the fridge until you’re ready for it. 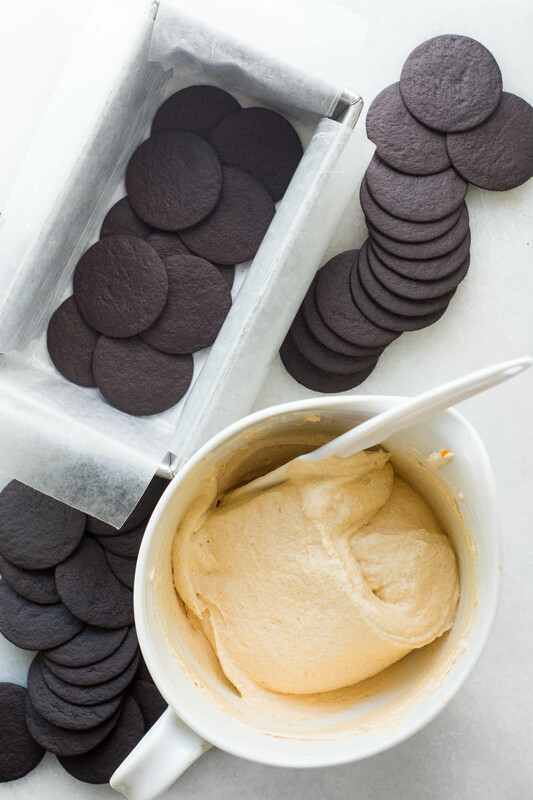 Of course you really can’t make a bad dessert with the ‘famous’ chocolate wafer cookies. I stock them year round, and pick them up almost every time I see them in the grocery store. The only trouble is we have a snacking problem in our house and they tend to go missing on a regular basis. 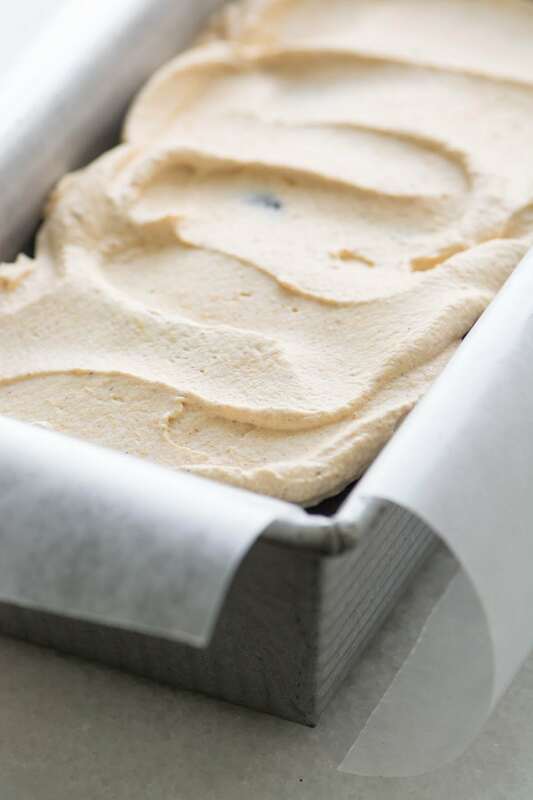 Start by lining a loaf pan with plastic wrap, waxed paper, or parchment paper. You want to do this so you can lift your cake out for slicing later. Spread a thin layer of filling on the bottom of the pan and lay down your first layer of wafers, overlapping slightly if necessary. Don’t worry if there are small empty spots between the wafers, that won’t matter. Top with a scoop or two of filling and spread out evenly. Then add another layer of wafers. 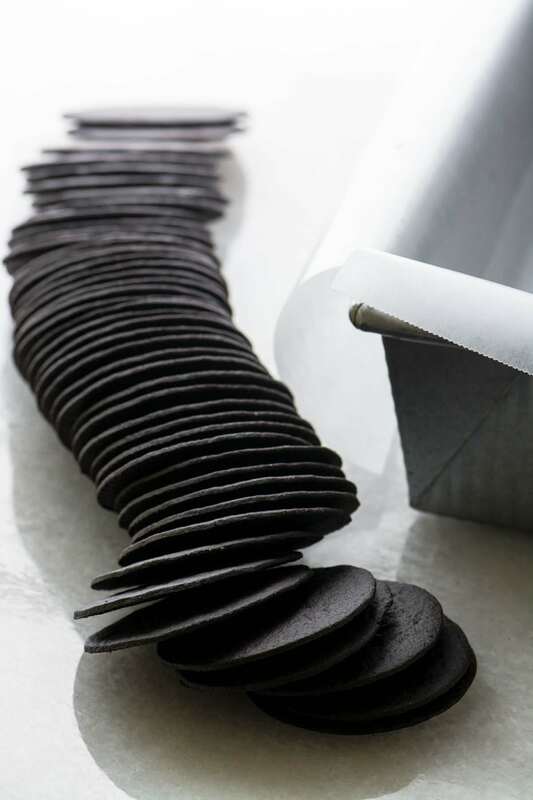 Press down gently on the wafers so they form a flat layer. Continue layering until you have filled the pan. Finish off with a layer of filling. If some of the cookies are broken (it happens) don’t worry, just layer them in, pieces and all, it won’t make any difference. 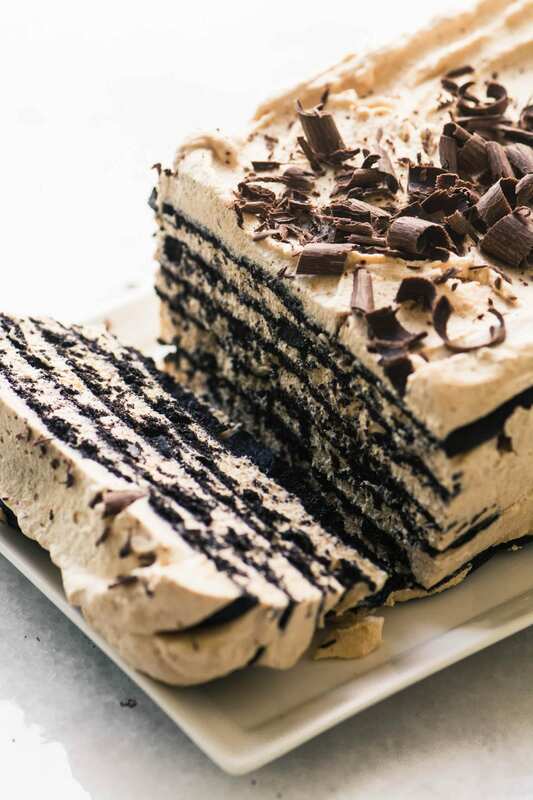 I love to garnish the top of my pumpkin spice ice box cake with chocolate curls ~ just take a vegetable peeler and run it along the edge of a bar of chocolate. Alternatively you can grate the chocolate with a box grater. I use this pan for everything from freezing ice cream to baking banana bread and meatloaf, it’s in constant use in my kitchen. It has thick walls and a naturally nonstick surface. The surface is also super easy to wipe clean. I threw away all my old scuffed up loaf pans and just use this one now. My Pumpkin Spice Ice Box Cake is part cake, part mousse, an easy no bake dessert that slices like butter to show off those layers of inky chocolate and fluffy pumpkin spice. Yum doesn't begin to describe it. Line a loaf pan with plastic wrap or waxed paper with long ends, so you can lift the cake out later for slicing. Whip the heavy cream until it starts to thicken. Add the sifted sugar and whip until stiff peaks form. Mix the pumpkin, vanilla, and spices together and gently fold into the whipped cream until no streaks remain. Spread a thin layer of the filling on the bottom of the loaf pan. Add a single layer of wafer cookies, overlapping slightly if necessary. Add a layer of filling (I used approximately 2 ice cream scoops of filling per layer) and then more wafers, pressing down lightly on every layer of wafers to keep them flat and even. Finish off with a layer of filling. Remove the cake from the pan and top with chocolate curls. Slice the cake with a large sharp knife. Your photos are so amazing it’s making me crazy. I’m not sure I’ve ever seen this kind of cookie in a store. I’m not one to saunter down the cookie aisle, so it’s not like I’ve looked all that hard. But fortunately, I do know how to make them! And I have yet to have anything pumpkin spice this year, so I think this is for me. If you know how to make them then you’re in for a treat. I avoid the cookie aisle (and ice cream aisle) at all costs, too, except when I need these wafers for a recipe ;) Thanks for the kind words! Making the cake in a loaf pan is genius……..but I have a question……..Do you turn the cake upside down onto a plate to get it out of the pan? Or do you just lift it out? Does the parchment slip out? You just lift it out and peel off the paper, don’t flip. The parchment paper makes kind of a ‘sling; so it’s easy to lift out of the pan. That will work great, and another option is thin gingersnaps. This looks so beautiful yet so easy to make!! I am totally making this .. adding all the ingredients to my grocery list! 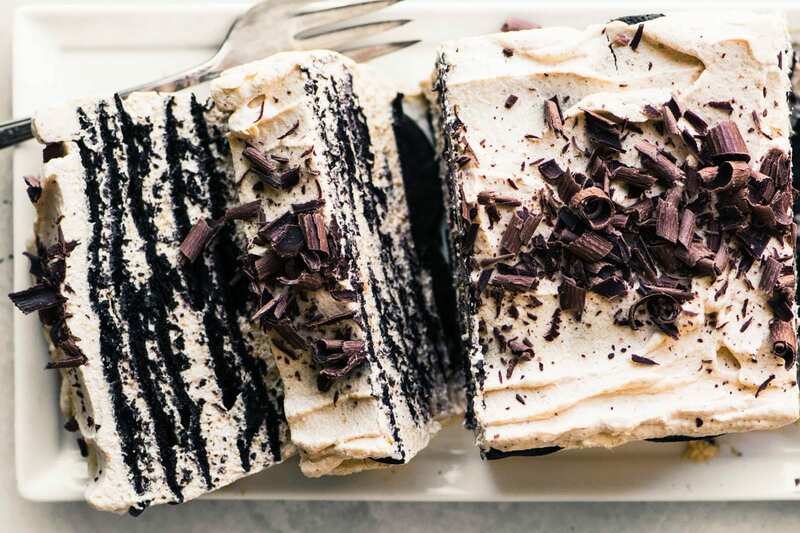 That’s the beauty of ice box cakes, they’re so simple. i love pumpkin and chocolate together…almost as much as peanut butter and chocolate! Brilliant idea to use the wafers as layers – this dessert looks incredibly delicious! OMG this deliciousness just got me seriously drooling. This cake looks absolutely fabulous. I love everything pumpkin spiced lately. I can’t wait to make and try this. I bet my family will be delighted too. This looks so delicious! I don’t think you could beat the texture or flavor. Perfect fall dessert! Oh my gosh, this looks amazing! Did you mention pumpkin too? 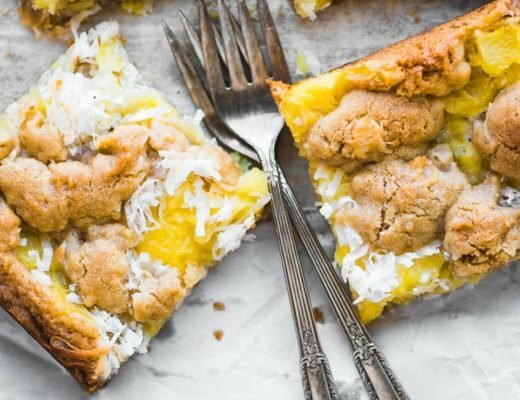 One of my favorite ingredients and combine it with an easy recipe like this? You have my full attention. Pinning to make another day. Dang! That looks and sounds amazing! I don’t think I have ever had one before! I totally have to make this. Thanks for the inspiration! You can put it in the freezer, Donna. I would keep it in the pan, and make sure to wrap it well.